It’s a pretty normal thing to do a little cross-stitch for a new baby, right, with little pictures and the baby’s name and birthday? The little bikes are from cartoon clip art that I found online. Â Three of the four hearts are from the book “A Rainbow of Stitches“; I made up the fourth pattern since the book only had three of that size. 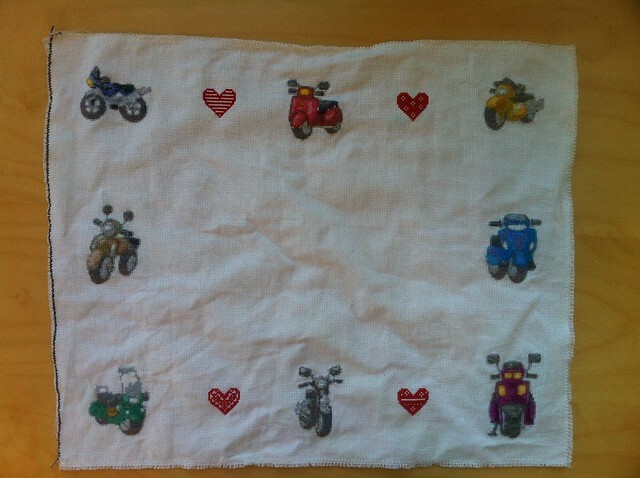 That made me think of the other motorcycle-related stitching I’ve done. This one was for Colleen, back in 2008. Â Clearly I didn’t yet know how to use the hoops without making dirt marks, oops. 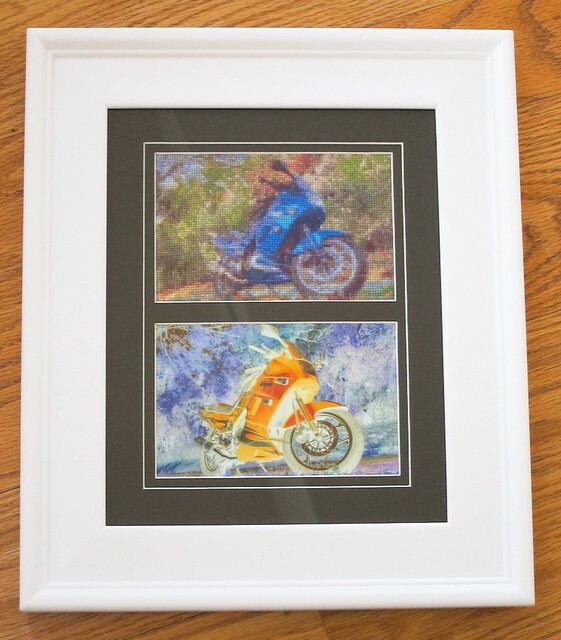 Â I did this piece from a photo of her KLR prior to buying the photo-to-pattern conversion software that I’m addicted to now. This one is mostly satin stitch, done on the side of theÂ MotoSport pannier bag for my cross-country trip on the F650GS in summer 2008. Â I ran out of time and black thread to do the tires and have been telling myself for almost 4 years now that I’m going to finish that up any day now. 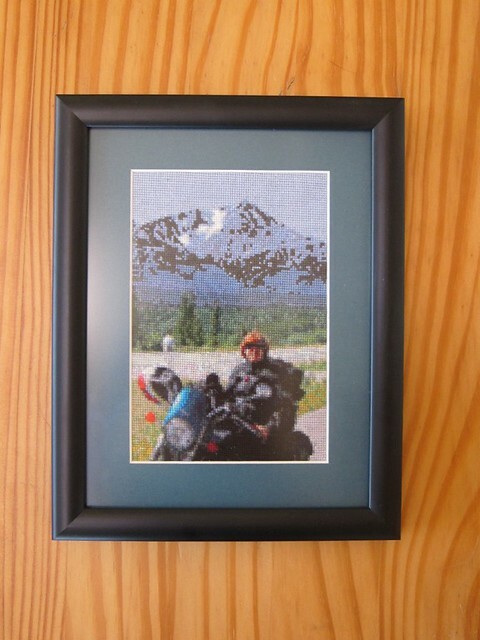 This next one was my first motorcycle-related stitching with the photo-to-pattern software. Â The piece itself was for Steph’s birthday in 2010; the photo is from our trip to Alaska in 2004. Â It’s one of my favorites for the great colors (as well as great memories). Finally, I did this piece of the Ninjette last year. Â I really like how the “real” colors are featured in the artificial/man-made part of the piece and the photograph is of the inverted/fake colors. Â This piece currently lives in my cubicle at work.